INsights - Blog | Ascension 360º - Navigating the New World Energies! Close your eyes. Take long, deep, slow cleansing breaths – in through the nose, out through the mouth. Now, breathe in the Yellow Joy Light Frequency. With your first inhale, bring in the Yellow Light through your nose and down into your heart. Let the Light expand into and merge with your heart. With the next inhale, bring the Joy Light energy further down into your lungs. Let it full and expand your lungs. Next inhale, breathe the Yellow Light deeply down into your stomach and lower abdomen, filling and expanding your entire torso. With the next inhale, draw the Light upward into your throat and neck and then into your head. Let it fill your mind and then spill up and out of the top of your head, showering down over your body. openings that will precipitate both a major ending and simultaneous new beginning. Small Shifts Change the World! This little video is wonderful. It is a great example of the difference a slight change can make in your life. Even a change that seems as small as the weight of a feather can clear away all that went before it and wipe the slate clean for a totally new possibility. Perhaps consider changing one small belief, limitation, block, expectation or concern and notice how all of life responds! Be sure to watch until the very end. Enjoy! Thank you to all of you who inquired about my well-being and safety after today’s unfortunate Boston Marathon event. I am fine, safe and sound. I was fortunately not in the city or near the Marathon event – Divine intervention had me be further south and then at home just beyond all the goings on. The friends I know who were volunteering at the finish line are also, blessedly, fine. I am, however, quite shocked and saddened by this occurrence and the unthinkable shaking up of such a positive, global appreciation of athleticism as well as historic celebration of patriotism on our Patriot’s Day holiday here in Boston. But let us not negatively absorb this into our energy fields. Let us not allow fear to overcome or overwhelm us. Let us not allow uncertainty and darker energies to uproot or unground us. And let us absolutely not allow our own individual or our collective “Marathon” through life, through the ups and downs of this evolving world, be interrupted, thwarted, thrown off course or stopped cold. So please join me in taking a moment to reconnect to and reaffirm the presence of The Light. Let us come together to send our thoughts, positive energy, love, light and prayers to all involved – to the runners, their coaches, supporters and families, to the volunteers, street-side cheerleaders and enthusiasts, to the event coordinators and committee members and all participating in whatever form. to the City of Boston, to the historic Marathon event and to the World, to Mother Earth, for healing and wholeness, peace and empowerment, perspective and a return to joy. I know it looks like more darkness than light is present on the planet at this time. It is actually the opposite, however it requires all of us to keep The Light in our hearts and The Truth in our spirits and not give permission to such events as today to tear us down, torch our inner fire or take away the spark that makes us Who we truly are – Divine Children of the Universe, Master Co-Creators and God Source Beings of pure Divinity and Love – no matter how else it appears. My dear Fellow ‘Soul’Journers and New World Walkers! Worthy of note on this synchronistic date of March 13th, 2013 – 3-13-13: a new Pope is elected hailing from Latin America – a key energy center of the Ascension and 5D world. This choice is unprecedented on many levels. First, in its historic occurrence as Pope Benedict XVI decides to resign and step down, something that has not happened in 600 years, yet opening the way for this new leadership to come forth. Second, the new Pope, Pope Francis, is from Argentina and Pope’s are not typically from one of the America’s – in fact it was announced that he is the first in 2,000 years to come from “the new world” – interesting choice of words – rather than old world Europe, and now he will lead the Catholic Church into our very New World indeed! And, finally and perhaps most interestingly, this new Pope is of the Jesuit order – a group usually thought of and even feared as being dissenters, outsiders and known for not being afraid of change. Pope Francis I is said to represent and embody: the common man and not the elite – reflecting the breaking down of separation and duality as we move into true Oneness; a commitment to service – a new theme of the new era and new world; reform – carving out the new path required for our human and spiritual REvolution and sustaining of our new vibration; inclusion, simplicity and humility – necessary seeds of Unity Consciousness; and Love. As this momentous event, bringing ever more exciting and accelerated change to our planet plays out, the New World continues to bloom and expand in fascinating and unexpected ways. However there is still work to do as old and outmoded attitudes and dogmas that remain at the core of the Church’s fundamental belief system – and that infringe upon and impact the rights and lifestyle choices of all beings (men, women and children alike) – are unfortunately still held by even this more progressive Pope. And thus, if we are to truly sustain our Ascension into these new energies and higher state of consciousness, we will need to see such traditional establishments move not only into the modern age, but into the Fifth Dimension – and that ought to be one heck of show. So stay tuned! My dear Fellow ‘Soul’Journers, Divine Beings and Guardians of The NEW Sun! At exactly 3:11pm PT/6:11pm ET today – Earth, Our Sun, the Center of our Galaxy (the Central Sun) & the Center of the Universe (The Great Central Sun) all came into precise alignment. These are very exciting and historic times indeed as this occurrence only comes around roughly ONCE every 26,000 years! We also entered a photon band of light that will infinitely increase the frequency of energy on our planet for the next 2000 years. As we experienced this incredible cosmic, inter- and intra-galactic alignment, we, at last, together, as One crossed the Dimensional Border into the Fifth Dimension and entered The Golden Age of Light or The Age of Aquarius! 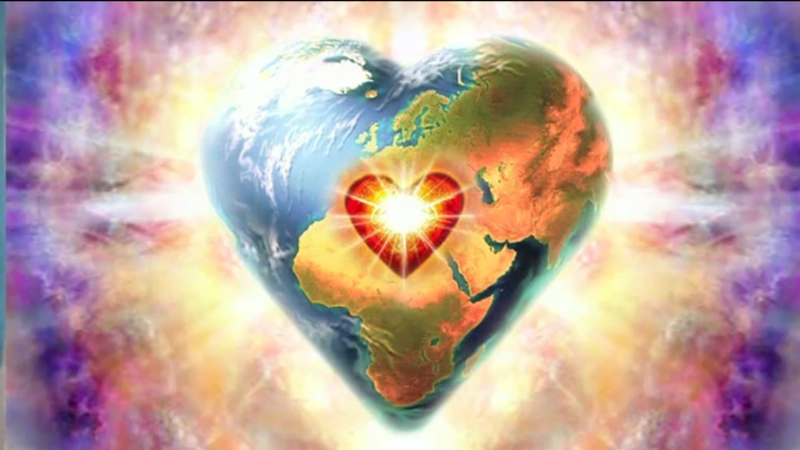 We have just ushered in a time of powerful Love and Light that will now take its place firmly on our planet. It is now up to us to ground this new energy with our hearts, thoughts, being and feelings, allowing nothing to knock us out of this new higher space of vibrating energy and consciousness. Each one of us has the power to create and manifest – dream into being, if you will – the new world we will live in within the context of this beautiful and extraordinary gift of new, pristine and pure energies. Welcome to the New Vibration. Welcome to Unity Consciousness! I look forward to the journey ahead with you all! Happy New yEARTH! In the wake of recent events, let us not focus on tragedy, pain, evil, anger or what appears and feels so terrible. Let us instead place our minds, our hearts, our energy and our spirits firmly and squarely on spreading and expanding the healing power of LOVE. The Sun will align with the center of the Milky Way Galaxy, and our solar system moves into direct alignment with galactic “headquarters” – with the Central Sun of the greater Universe and the Great Central Sun of All Universes. This alignment only occurs once every 26,000 years! We will experience several planetary and lunar eclipses over these three days and an influx of intense energy and expanded consciousness giving us access to higher dimensional realms, bringing in heightened awareness to more advanced and responsible ways of living and being on the planet. On December 25th, we move out of the energy of Pisces and usher in the Age of Aquarius. Let us take note of these extraordinary times and the power that they bring. The earth shook the North American West Coast, the wind tore up the East. Two coasts shifting, clearing, breaking down and apart. Two sides of one country then coming together to heal, uniting divided minds, opening protected hearts. Politics, Economics, blame – all give way to Love. Desire more Prosperity? In these Heart Energies and New Vibration, it will not be gained externally. Prosperity is an inside job and YOU are the Source. Key#1 is healthy Relationships – primarily the one with YOURSELF. Key# 2 is Love & Forgiveness – of yourself, others and even your enemies! Embrace to E X P A N D! The 8th Gateway of Transcendence is pushing us to the brink. The darkness is challenging even those holding the highest light. When your boat gets rocked by External forces, find your rock… within. Transcend. This is THE way through and into higher consciousness. Transcend to Ascend. The gateway of 8/8 opens this day, bringing in the 8th ray of Transcendence. And the energies go round and round and our emotions up and down as we ride this crazy carousel of life! Find yourself feeling limp of life and breath of late? Be still. Sit and let the vibration catch up to you. It will all ease with the next spiral’s turn. Today is not just a celebration of our Independence as a Nation here in the US. As we move into a new consciousness and awaken to a higher Knowing – let us also celebrate the Independence of ourselves from the tyranny of our illusions, limiting beliefs and mind-generated false perceptions. Let us celebrate and remember Who we really are as we step into the true meaning of Life, Liberty and the Pursuit of Happiness.